Families are unpredictable, particularly small children and pets. There are many places where kids can find themselves in trouble. Your garage can be particularly dangerous, due to the various items and equipment that you probably store inside it. For this reason, it's important to follow a few safety guidelines when children or pets are inside this part of your home. You should pay special attention to the garage door, as this mechanism can cause serious injuries if it isn't treated with the proper caution. One of the first things we should teach our children is that garages are not play areas. Cars, tools and household cleaners and solvents can be dangerous, and these are the type of things that can be found inside the average residential garage. When it comes to the overhead door, additional caution is needed. Although modern garage door openers come with sensors that can detect an obstacle and stop the door in its track and even reverse it, it is always better to be safe than sorry. Make sure that you always keep an eye on the door while it's moving, and educate your children on the dangers that it poses. Don't let them turn your garage into a playroom, at least not until they're old enough to use the door on their own. Children are naturally curious and find the simple act of pushing buttons quite fascinating. For this reason it is important to install the garage door opener's wall switch high enough so that it is out of reach of their small, curious fingers. Similarly, the opener's remote should be kept in a safe place, also out of reach. This will also ensure that the door doesn't malfunction from being constantly played with. Like small children, pets can also be very unpredictable and it only takes a second for trouble to strike. Pets, particularly small ones, can quickly run underneath a moving garage door and the safety sensors may not notice them in time. Since pets can't really understand the repercussions of their actions, it's up to you to keep them away from your door until it finished moving. If you find that any part of the system is failing to work properly, or you're interested in upgrading anything from the opener to the door itself, you should reach out to our team. 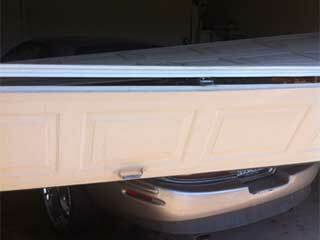 Garage Door Repair San Tan Valley can help you with all sorts of different issues. Contact us today for more information.